Countless New Yorkers, as well as visitors from all parts of the world, have experienced an oasis just a few feet off Fifth Avenue in the heart of Manhattan. Since the 1860s, Central Park has been the home of three different zoos: the menagerie, the zoo of 1934, and what is today known as the Central Park Zoo. 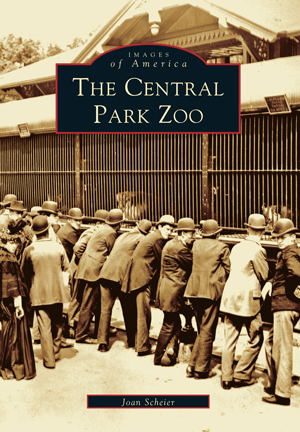 The Central Park Zoo begins with the menagerie of the 1860s, an impromptu public zoo begun when citizens and circuses started donating animals to the city. It continues in 1934, when Robert Moses-perhaps the most influential man in the city's planning history-built a newer zoo, remembered to this day for its lions, tigers, elephants, and gorillas. It ends with the brand new zoo and exhibits built in 1988 under the supervision of the Wildlife Conservation Society. With stunning, rarely seen images, The Central Park Zoo not only is a treat for the eyes but also comes alive with the barking of sea lions, the soft fur of snow monkeys, the sweet smell of peanut butter, and the taste of "ice cakes"-treats for the zoo residents, of course. Joan Scheier grew up going to the zoo. She served as a city public school librarian for more than a quarter century and is now a wildlife guide at the Central Park Zoo. Her familiarity with the city's history and architecture, her love of zoos, and her extraordinary talent as a researcher and writer combine to create this loving tribute to one of the city's most memorable places. Scheier lives in Queens, and her favorite animals are the sea lions.